Property Size 1,835 sq. ft.
Gated/Guarded Resort Community with Free Movie Theatre. Large Private Pool with No Rear Neighbors. This gorgeous, newly remodeled 4 bedroom/3 bathroom private pool home features an oversized great room. It also offers two master suites, one with a king bed, TV, garden tub, and a separate shower, the other with a queen bed and TV. 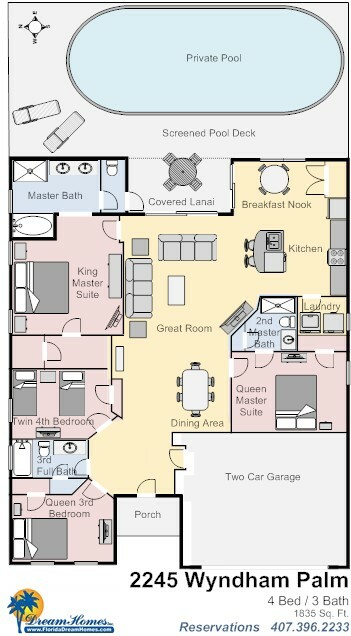 The spacious floorplan is perfect for families or larger groups. This home features high speed internet service and a private pool with no rear neighbors and western facing for wonderful sun during the day. A dining table with six chairs, breakfast nook with four chairs and two counter bar stools provides enough seating for your entire family to enjoy meals together. A fully equipped kitchen with large refrigerator helps provide a convenient way to save money by making some quick meals and theme park snacks. The full size washer and dryer means you can wear your favorite outfit more than once and keep costs low for baggage fees. Perhaps the best feature of this home is the guarded/gated upscale resort community. It features a movie theatre that shows free movies throughout the day, a workout room, gameroom, sundry shop, large pool, hot tub, basketball, volleyball, children's playground, tennis, BBQ pits, and walking trails. This home is perfect for your family to experience the vacation of a lifetime. 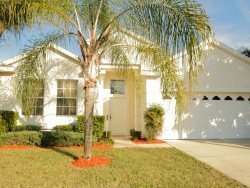 4 Bedroom/3 Bathroom Home with Private Screened Pool, Pet Friendly, Gated Resort Community, Two Master Suites, Washer/Dryer, Fully Equipped Kitchen, Free Wireless Internet, Expanded Cable, Close to Disney. The community is located just a minute or two from a full service grocery store and a 24 Hour Pharmacy/Sundry shop. There are also many restaurants (from fast food to fine dining), home improvement stores, mini-golf, Sam's Club, Costco, BJ's, and numerous other smaller attractions very close by. Olympic Size Pool, Spa, Kiddie Pool, Game Room, Pool Tables, Ping Pong Tables, Weight Room, Sundry Shop, Picture Kiosk, ATM, Conference Room, Wireless Internet, Movie Theatre that plays Movies all day, Shuttle Service to area attractions (for a fee). Place was very good, host was very helpful. I recommend everybody to visit this place. We spent a week and we did not want to leave. We were very comfortable and the house was amazing. We went to Disney World and it was so close to us. Shopping was super close and very convenient! Will definitely be staying with them again! This was our second time. This place is amazing! My family loved to stay here and would like to come back soon. I really recommended this place to everyone who wants to spend a great vacation with family and friends. This place is really spacious and clean. Well maintained and appropriate for families. Thank you for being a great host. My family loved to stay in your house and would like to book it next time. Thanks for your quick responses and for your hospitality. The home was really nice and nicely updated. We had a wonderful stay. Our granddaughter loved the pool as all of us did. The only thing I might mention is I think the pool and pool area could use some updating. Maybe some repainting of the pool. Otherwise, we thought the home was really nice and we loved the fact that it was a gated community and had a 24 hour person at the gate. We will definitely stay there again. We loved the week we spent in this absolute gorgeous home. Not only were we impressed by the home but with the overall service in making our family vacation such a special time. The staff was so helpful and we couldnt have asked for a better week. It was ideally located - close enough to everything and yet secluded enough to make it ours. The pool was the highlight of the whole thing, of course. But the privacy that the house offered was ideal- even thought we had a big group we were able to enjoy our own little haven. Home away from home minus all the busyness and stress. And the comforts of home like home cooked meals when we wanted. This is our 3 time renting a home and I would never use anyone else. My boss and I were traveling on business and decided to make a long w/e of it and take our daughters and make a girls weekend of it. We had a blast! The girls were in no hurry to get to the Magic Kingdom and why should they be when you have a house like this. Step out of the kitchen and youre in the pool. Whats not to like. On our arival the house that we were assigned to was already occupied. But Lance told us to go to dinner and he would meet us at the restaurant with a new key. He did very shortly and the keys were to a larger house than we reserved! A great rental, anc a great company to rent from. Ill do it again for sure. During the past 40 years we have stayed numerous times in the Orlando area mainly in top rated 4 and 5 star hotels. Renting a home was a concern when we made the reservation because we had never done this before. The reception at the office was first class and our first view of the house was WOW. We had the most pleasant, relaxed stay ever. The feeling of security on the property was a bonus as we went for daily walks. Although our travels since then have taken us elsewhere we look forward to returning to Orlando and again renting a dream home. We have recommended this service to many people especially those travelling with family. Thank you for a great service. The reservation and key/documents pick up and delivery went very smooth. Staff very helpful. We spent great time. The kids loved every moment, especially the pool and the TVs. The resort with its club house pool was a great feature. The house is big and sufficed all our needs. It was very clean. Also, close to everything from Disney, to restaurants, shopping, beaches,..etc. We had great time. The high speed internet wired and wireless was definitely a plus. Very Minor points like no wireless garage door opener and tough to adjust thermostat were there but didnt affect our enjoyment. Just nice to fix/have if possible. Weve really enjoyed our week at this nice and confortable home ,in a great community . The only thing that is not very good is arriving after a 12 hours flight on a Sunday morning with my 2 Kids and had to wait to check in after 4:00 Pm (I already Knew that it should happen ,but in a hotel you are checked in at the time of your arrival)and on the last day ,check out at 10AM was not so nice for us because our flight back was 6 PM . Besides that ,I think that this kind of problem should be worst for international guests ... I was helped by Giselle ,from Florida Dream Homes and she was GREAT! !She explained everything that I asked by e-mail and phone , and I really appreciate her help . As a suggestion, maybe next time they have to provide a newer broom ,because the one that they have at home couldnt help any cleaning . In the end ,it was a great experience! For sure ,We will be back! We found this house to be very comfortable and relaxing. The house was beautiful and very spacious. Very nicely decorated and had everything we needed with small kids. The beds were comfortable. There were a few complaints I have about the maintenance of the house. All the sheets on the bed didnt smell or seem fresh, they didnt look like they had been washed. I had spoken to someone before I came to check the sheets because last time I rented from Dream Homes, one of the beds had blood on it, which told me the house wasnt inspected as they say they do. The dishes in the cupboard were stained and chipped, we didnt really want to drink from the cups etc. Great Location, so close to everything. Our recent trip to Orlando was very nice. Having traveled to Orlando and stayed at a Disney resort two months eariler I thought we would try Vrbo. Weve used this for other vacations and have been quite pleased. The house we stayed in was fine. The fact that everyone had their own room was great. Three of the rooms had full size or bigger beds and the three bathrooms made getting ready in the morning a breeze. I was disappointed with the pool area. It seemed a little dirty and not kept up. The Florida Dream Home staff was spectacular to work with. We would likely stay with Florida Dream Homes again, just probably not this particular property. We had a great time in Orlando. We all felt at home in the house right away - even Lady, our dog, settled in quickly - and we found everything, we needed, there. Location was great too! We hope to be back soon! Whenever my family and I vacation in Florida again I will stay in a Florida Dream Home. It is just like your very own home. All you need to bring is your clothes and everything else is there. I loved it!! It was a wonderful home. We have stayed in Dream Homes for many years now and have never been disappointed. We stayed in the home with 5 people and it was great for all. the pool was not used very often because it was ice-cold. Its a very secured area and close to restaurants!!! We loved to meet Lance & Karin for lunch :-) and we cant wait to be back in one of their homes. The house was perfect, with a perfect location, excelent service and very comfortable. Traveling with two 4 year olds and one 2 year old is stressful when you have to share a hotel room. This gave all of us adults an opportunity to relax once the kids were put to bed! This definitely upped our relaxation level on our trip! I thought the place was a dream come true when we put the key in the door and opened it up it was amazing. We couldint have asked for more. The only thing that went a little wroung was when we arrived it was on a sunday and the place were you pick up the keys was closed so we got a little worried but there was a emergency phone number and they called us and gave us the code to get the key. Other then that we didint have a net to clean the pool when it got dirty , but its screened in so it wasint that big of a deal. That was just miner things that got token care of. The house was amazing and it was so close to disney world and close to all these restaurants. The next time I go to florida I will definitely go there again. And I recommend anybody that wants to have some fun go there. Couldnt have asked for better place to spend our Christmas vacation. Customer service was great. Getting our keys after hours was no problem at all. House was spacious and clean when we arrived. Very quite neighborhood. Pool was nice to relax in too. Plenty of space for nine people. Most importantly, Disney was only 10 minutes. Grocery store and places to eat were also close by. Only one thing I would change, the comfort of the beds. Wish they were a little more comfortable. Overall, great vacation. According to our daughters, "best vacation ever!!!" Magical, not only describes our Disney experience,but also our accomodations while in Florida. It really started with our first phone call to Florida Dream Homes when we were treated with friendly and knowledgeable service. The day we arrived to pick up our keys was equally as impressive. We asked "tourist" questions and they had answers. It was only a short drive from their office to our vacation home. There were 8 of us total traveling and staying together. The house met all of our expectations and beyond. It was very clean, with modern accomodations. The ameneties were more than we had expected. It had a complete kitchen with everything right on hand to prepare and serve meals. ... Would we stay with Florida Dream Homes again? Absolutely!!! The reasonable cost to rent, the wonderful quality of the home, the ease of commute, the friendly staff, and the lasting memories of our "dream home" vacation will keep us coming back for sure.